Radiotracker! Music Internet Radio Streaming. Radiotracker streams at high speed aDSL internet connection thousands of music files for you! Select music genre, push start button, wait a few moments short while, enjoy music. Radiotracker streams tracks from shoutcast radio stations. More facts: 77 genres, 8.000 radio stations, ID-3 tag, normalization, fade, perfect quality through minimum bit rate, no duplicate music tracks, full control of bandwidth utilization, control recording according to time and memory requirements. Test the Standard version! 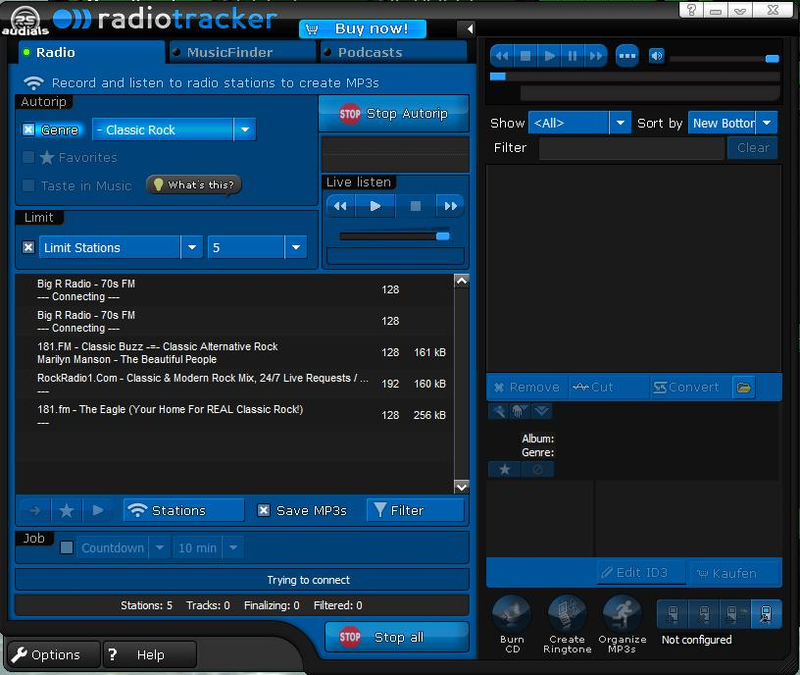 Radiotracker Premium can even more: Listen to Internet radio stations while recording, get CD covers, extended administration of your favorite stations, sort tracks by genre or radio station, filter unwanted artists, add individual radio stations to your favorites. Even your Granny can do this!